Living in a hot and dry place? In that case, you know exactly how important a cooler is.But are you aware of the energy-efficient alternative to your conventional cooler? Yes, we’re talking about the solar cooler. Solar air cooker is the air cooling systems that are powered by solar energy. These air coolers are a combination of highly efficient cooling systems and solar thermal panels. This amazing collaboration brings out the most energy efficient coolers you could ever get. With the use of solar power for air cooling, you can save a fortune on your monthly electric bills. 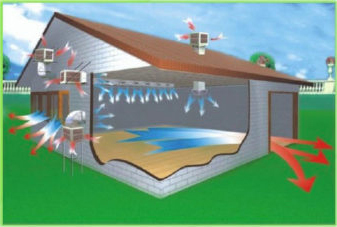 Although solar evaporative cooler can be a bit costly, you would earn the return pretty soon with huge energy savings. Unlike conventional air coolers or air conditioner that use electricity, solar air cooler is powered by energy produced directly from solar panels or battery. 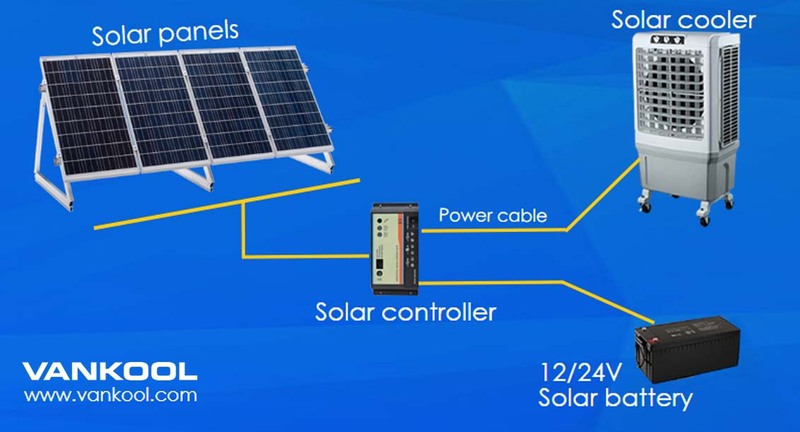 On a sunny day, the solar panel produces DC current which is directly used by the air cooler. A backup battery is charged by the solar panel and used during night times or low sunshine days. 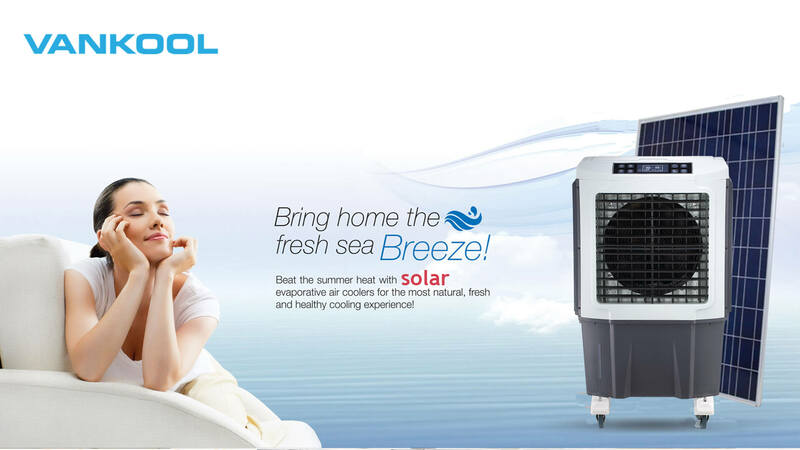 The advantage of using solar cooler is that it is economical because it totally eliminates the consumption of AC power. In addition, buying a solar power cooler is cheap as you will get back your money in a short period. This is because of savings you will make for not using the costly electrical power. 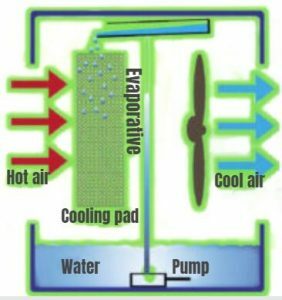 How does solar air cooler works? Not like solar air conditioner, The solar powered cooler uses a simple evaporative cooling principle to lower temperature. The dry and warm air is collected from outside and pushed inside using a turbine. 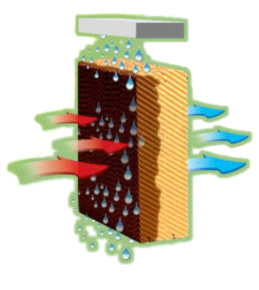 The air collected then passes through a wet permeable layer where it is cooled. This results in evaporation which in turn leads to a drop in temperature of the dry air. This system purely works on solar energy or battery with 12/24V of power. 1.The radiant energy from the sun is converted into electricity using solar cells that are in the solar electric system. The generated DC energy is then stored in a battery. 2. Hot and dry air is pulled by the fan and pushed through moist cooling pads. This, in turn, converts the dry air into fresh cool air. 3. The pads are evenly saturated by water pumped from the bottom pan to the top and left to flow down. The air is then pulled through the pads using powerful blowers which then forces the water to evaporate. This, in turn, lowers temperature, and the fan blows the cool air at a high velocity in any direction. 4. 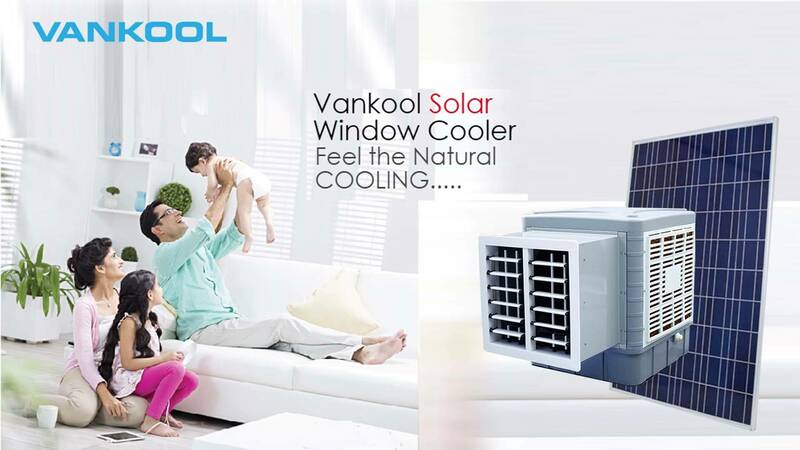 Vankool solar cooler works perfectly in both indoor and open areas. They are easily fixed on the roof and in walls providing cooling and great ventilation. Can solar power cooler work everywhere? Yes, the solar powered swamp cooler is designed in a way that makes it work anywhere. It can be used in rural areas where there is no electric grid and also in industrialized zones. In addition, a solar air cooler can be used in interior spaces such as warehouses, offices, industrial ships etc. 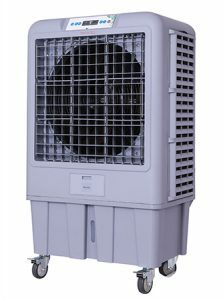 For exterior space, the air cooler can be used in mines, fields, beaches, events, agricultural etc. There are various benefits that you will enjoy when using solar energy. Use of solar energy has proved to be an effective way of generating renewable energy. This energy can be used in both air cooler and other appliances. Solar panels can last for over 25 years giving you service and outlast all other appliances in the house. 1) Quickly cools a large area in a very short time, unlike other conventional systems. 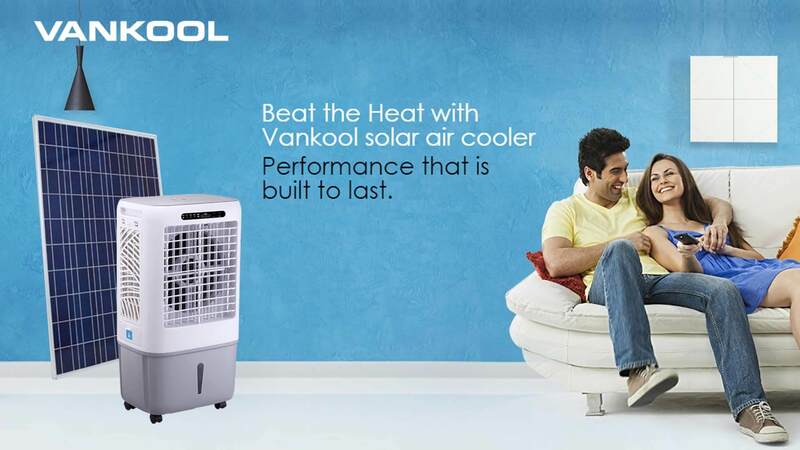 2) Our solar air cooler uses 100% solar energy. 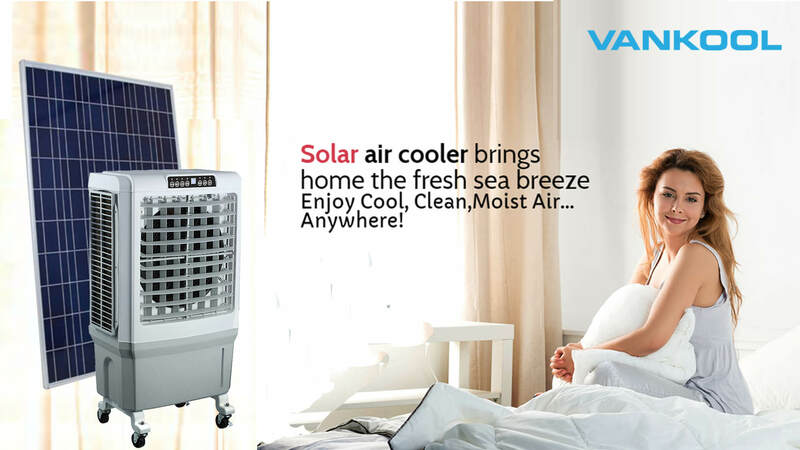 This implies that you will enjoy longer refrigeration of your room without worrying about the high cost of electricity. This, therefore, lowers the operating cost of electricity in your house. 3) Since solar water cooler play a major role in saving the environment, it enjoys tax incentives in the US and Mexico. This implies that you will be able to deduct the acquisition of this equipment. 4) You will help in the conservation of the environment. The solar swamp cooler uses solar energy and water, which are environmentally friendly with no contamination. Other CFC gas coolants have played a significant role in the depletion of the ozone layer. 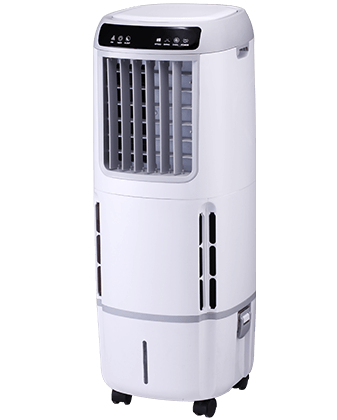 5) You can opt for federal government programs and grants to help finance the acquisition of your solar evaporative cooler. Governments give economical grants and subsidies when acquiring technology that use renewable energy. 6) The solar air cooler is versatile and can be used anywhere. This means that you don’t have to worry if you come from a rural/cold areas with no electric grid. 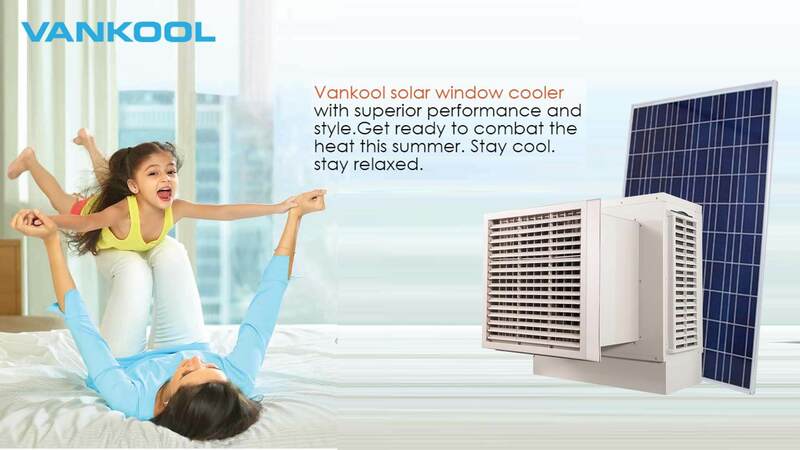 Vankool solar air cooler is the best cooling system you can use to convert solar energy into a refreshing breeze. This system uses an innovative technique that ensures there is more cool air flowing. This, therefore, gives you a consistent and comfortable breeze in your room. In addition, the cooler works with water evaporation. 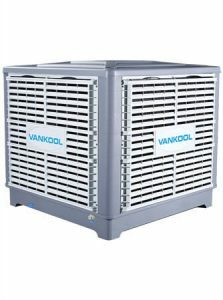 Vankool solar cooler could work under 12V or 24V DC power,and it’s a durable and safe device to use in your house. Get answers to any questions you may have by skimming through our FAQs. If you are unable to find the answer you are looking for, feel free to email us for assistance. Q: What are the advantages and disadvantages of solar coolers? • Solar power helps to conserve the environment by reducing global warming. • Solar power saves billions of dollar from going to waste. • Solar power ensures there is the reliability of energy. • Solar PV panels do not produce electricity when the sun goes down or when heavily shaded. • The sun does not shine 24 hours. • Solar power is not 100% reliable. This means that you may need other power sources during the above times. • You have to buy batteries to store solar energy which will be used later. Q: Are evaporative coolers suitable for specific climate? 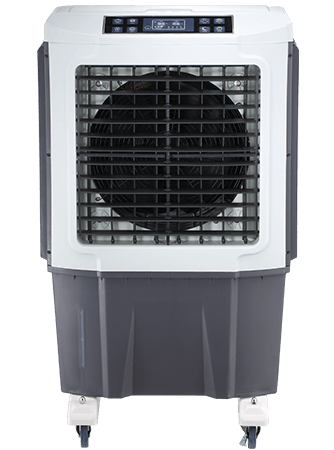 The evaporative coolers work best in areas that have hot air with low humidity. However, there are areas with high humidity but evaporative coolers have proven to be cost effective. These are factories, garages, athletic events, warehouse, construction site, etc. Q: What are the advantages of evaporative cooling compared to refrigerated cooling system? I. The evaporative cooling system saves a substantial amount of energy compared to the refrigerator air unit. II. 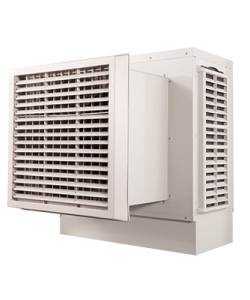 The design of the evaporative cooling system is made in a way that requires low maintenance. III. 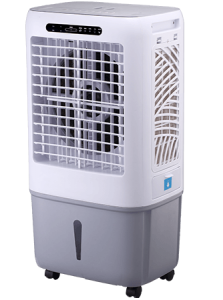 Evaporative cooler provides a constantly changing filtered air that is fresh while still conserving the energy. IV. 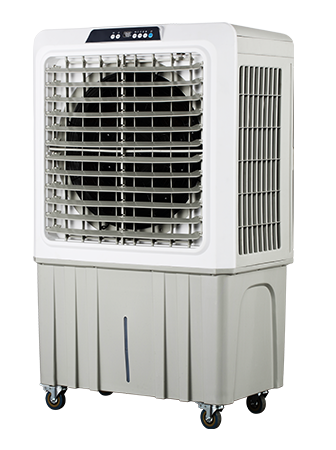 The evaporative cooling systems have various application compared to a refrigerated cooling system. These are area/spot cooling in factories, schools, laundries, restaurants, churches, etc. Q: How often do I have to clean my pads? It’s recommended to have your pads cleaned at least once before you can store them for winter. If you live in hard water areas, you will need to have your pads cleaned frequently. It’s good to always have a periodic visual examination of the pads. Follow the instruction from the manual to remove the back/top of the cooler to examine the pads. If you notice they have deposits of heavy minerals, then you need to clean it. Ensure that you unplug your cooler from the power source before examining. Q: How do I clean my pads? Pads are inside the cooler and you will have to get them out. Just use the manual instruction given to remove the back or top of the cooler. You will then be required to remove the pads from the back panel or the unit. You can either use a hose to rinse the pad or soak it in a tub until all the mineral deposits dissolve. Once you have finished the cleaning process, place the pads on the sun and allow them to dry. You can then re-attach them back to the cooler. Q: How often should the pads be replaced? In case you notice there is a change in cooling, it means the pads are no longer effective. This happens especially when there are heavy mineral deposits on the pad. The continuous accumulation of these deposits may stop the water from being absorbed into the pads. A well-maintained pad that is regularly checked and cleaned can last between 3 to 5 years. However, to have an efficient cooling system, we advise you to change the pad 2 to 3 years of use. Q: Why is the cooler not cooling as I expected? There are 2 factors that may be affecting your cooler effectiveness. First, check whether the water in the tank is full. There is a water indicator which is located on the top or is at the face of the unit. Check to see if it indicates the water is full, if it’s not, you will need to add. Secondly, humidity affects evaporative cooling. If the humidity of the air cooled is high, the cooler will be unable to lower the temperature. If the outside humidity is above 55%, the cooler will produce the lowest temperature it can produce. So if the humidity is low, you will need to have your door and windows open to lower the room temperature. Q: Why do you have to have windows and doors open? This is because humidity is required to increase the cooling process. The increase in humidity will mean that the door and windows need to be opened. These openings will be used to release moist and cool air from the room. If the cooler is operating in a closed room, it means that it draws the air from inside the room. This air in the room is saturated with humidity already. If this persists with the door and windows closed, the temperature and humidity level will increase in the room. This will make you feel uncomfortable staying in the room. It’s, therefore, necessary to have the doors and windows opened so that the cooler is able to draw warm, dry and fresh air across the wet pad. Q: How much water do I have to put in? There is no fixed amount of water set, this will depend on the size of unit you have. For you understand the correct level of water required, there is a water level indicator equipped in each evaporative cooler. The water indicator is located just on the bottom sump of the cooler. If the water is less, just add until the indicator shows the water is full. Our wall mounted solar coolers have float valves that automatically controls the inlet of water. To add water in this, you will need to connect the float valve with the water hose to fill. Q: Why does the air have a slight odor at the startup? This is common when evaporative coolers are used for the first time. To get out this odour, you will need to run the cooler for an hour then drain and add fresh water. If the odour still persists, repeat the same procedure until the odour is eliminated. Q: How often do I have to fill the mobile unit? This will be determined by the speed which the cooler is running and the dryness of the air. Typically, the water that is supplied should last for half/one day. This is because the tank is designed for 4 hours consumption or 8 hours use. Q: Can the pump run dry? There is no harm caused to the cooler or water pump if it runs without water. However, you should never buy a cooler with a submersible pump like the one used in glass fish bowl. This is because it can’t run without water and can burn causing a lot more danger.